Fannie Mae owns a lot of foreclosed-upon homes, many of which are woefully undervalued. Large institutional investors have recently been snapping up repossessed homes in depressed areas at bottom-dollar prices, betting that the value of these homes will increase enough to be sold at a handsome profit. Thus, some real estate brokers will do whatever it takes to get their hands on those listings. Staffers at the Irvine office — and other regional Fannie Mae offices — were given the responsibility of doling out these listings to brokers. At least one employee has been arrested following an undercover sting operation in which he was caught allegedly trying to sell a stack of foreclosure listings to a real estate broker from Tucson, AZ, for $11,200 in cash. Another former employee at the Irvine office is suing Fannie Mae, saying she was fired for trying to blow the whistle on kickbacks and other questionable practices like including marketing homes without clear title. She says she began alerting the now-fired VP to the kickbacks back in 2009 and that her complaints went nowhere. 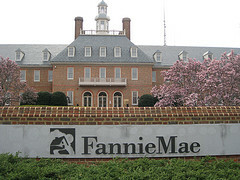 Fannie Mae claims that an internal investigation of those allegations found that the employee had no hard evidence of kickbacks and never saw cash change hand. The dismissal of the VP responsible for the Irvine office — even if the company says it is unrelated — appears to be one of several responses Fannie has taken with regard to the ongoing scandal and investigation by the U.S. attorney in Los Angeles and the inspector general of the Federal Housing Finance Agency. Recently, the company has changed the way in which property listings get assigned to brokers. “[O]ur sales associates will not make assignments to brokers, reducing the potential for conflicts of interest,” Fannie tells the L.A. Times.